alaTest a collecté et analysé 168 avis de consommateurs et d'experts pour le produit Delonghi EC 152. La note moyenne du produit est 4.1 sur 5, tandis que les autres produits de même catégorie ont une note moyenne de 4.4 sur 5. Les testeurs apprécient la performance. Les performances impressionnent, mais les auteurs d'avis sont moins positifs sur la qualité de construction. En moyenne, les consommateurs notent ce produit 83/100 et les experts notent ce produit 64/100. 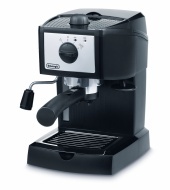 De Delonghi EC 155 is geschikt voor zowel gemalen koffie als ESE-servings. Hij heeft een uitneembaar lekbakje en een geïntegreerde koffie-aanstamper en een stoompijpje. I'm not a big coffee drinker but this seems to make a decent latte. Very cheap in the black Friday sale. Can use a mug if you remove the drip tray. My friend got one too but he thinks the milk frother is too short and seems to struggle a little with the size of the machine. It works froths milk very well. It was good value for money l bought this in the sale it's compact and easy to use. Design not very attractive. A bit messy to use but East. could be slightly taller to use a bigger mug. The detachable milk frother could be longer to make cleaning of the steel pipe easier, milk tends to 'stick' to it. This is really easy to use once you get the hang of it. The fitting was all a bit tight tight to begin with, but now it slots in easily. Makes nice coffee too! It's very plasticy/not sturdy, but that's to be expected given the price.